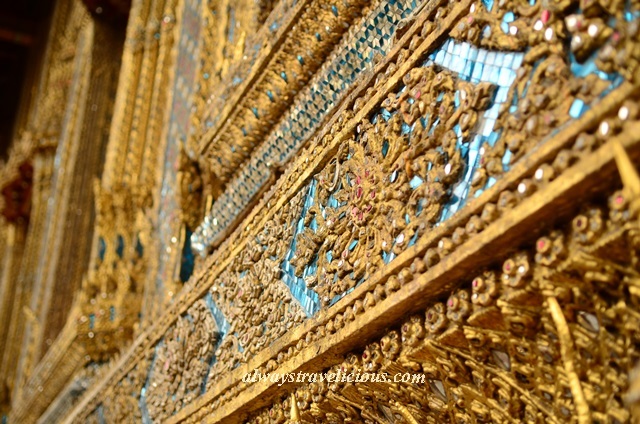 Wat Phra Kaew Temple @ Bangkok, Thailand - Always Travelicious ! Wat Phra Kaew is THE iconic temple in Bangkok that enshrines a 66 cm tall jadeite Buddha statue, and hence also the name “Temple of the Emerald Buddha”. Thailand is a country with a long history of Buddhism with the earliest signs of Buddhism as early as the 5th century. Many grand temples and shrines were built and if there is only one temple you could visit in Bangkok, it would be no other than the Temple of the Emerald Buddha. Before you even walk into the main hall (or “ubosoth”) to see the the famed Buddha, you would be dazzled by a myriad of jewels and intricate decorations that adorn the walls of the main hall. There is simply too much bling everywhere ! This is the entrance that brings you to the emerald Buddha. The doors are equally impressive. 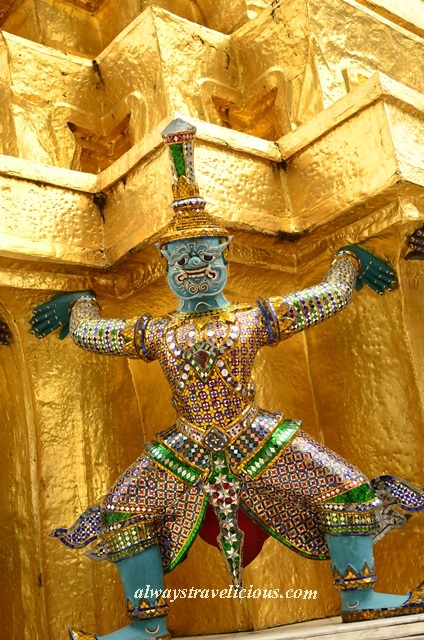 The glimmering statue draped in golden clothing that sits atop the pedestal is the Emerald Buddha. The history of the Buddha dates back to 5 BC, when the Buddha was thought to have originated from India. After hundreds of years of turmoil, the statue traversed through different countries and civilizations including Laos, Cambodia, and civilization of Ayutthaya, before finally settling down in Thailand. There are three different sets of clothing that correspond to different seasons and only the King is allowed to change the Buddha’s clothes. No photos are allowed inside the hall so I could only take it from a distance. Other notable and glittering buildings include the Royal Pantheon (“Prasat Phra Thep Bidon”) flanked by two symmetrical golden chedis. The Royal Pantheon was supposed to be the original place to enshrine the Emerald Buddha although it was thought to be too small later on. and the half-bird, half-human “kinnon”. whereas the Sri Lankan golden “Phra Si Rattana Chedi” houses Buddha’s ashes. and many chedis in the vicinity. Interestingly, there is a miniature Angkor Wat next to “Phra Wihan Yot”. Admission Fee : 500 Baht for foreigners. Pingback: Grand Palace @ Bangkok, Thailand | Always Travelicious ! The demons seem to be punished with loads of weight thrust on them. As one of the top places to see in Bangkok, Wat Phra Kaew should be in your top list when you pay a visit to Bangkok.